In April I posted an article on retopologizing (like that is a word – redoing the topology of) mesh objects in Blender. See: #SL Blender Clothes Retopology. In Blender 2.62 I kept having problems getting the method to work. I think it was more me than Blender that was the problem. Whatever… today a decided to figure it out. I plan to do more tutorials. One of the things I want to do is work with weight painting to see if I can make skirts that work better than what we have. The current mesh mini-skirts show it all when one sits down. I don’t think it has to be that way. Now I need a well made skirt to work with. So, I’m studying 3D modeling. One of the things modelers deal with is redoing the topology of high polygon into low polygon models. Using the tools built into blender can make changing the topology much easier. So, here is the video that got me started. You only need to watch the first 3 or 4 minutes. What you see is he is using SNAP to move vertices to the surface of his model. I had so much trouble getting this to work. I have watched the video dozens of times. I didn’t get how this works until I went and read manuals and did some thinking. There is a part of ralusek’s tutorial that I passed right over. It involves where the model is in respect to the screen/viewport. In my opening image the quads marked ‘A’ were made with Vertex Select on (D=Edge Select – next icon to left). The quads marked ‘B’ were made with Edge Select on (D). In ‘A’ things were sinking into the sphere more than they did in ‘B’ were they tend to float on the surface. If you look at ‘C’, you can see where I selected individual vertices and moved (grab) them so they snapped to the surface of the sphere. Now, how to get this to work? It’s not hard, I just didn’t get it. Starting with ‘D’ pick what you want to select to move; a vertex or vertices, edges, or faces. ‘E’ limits your selection to only those things that are visible. That means I will only select the surface of the sphere that is facing me. ‘F’ turns on Snapping. This is sort of a toggle. With this disabled you can still snap by pressing Ctrl. With it enabled you and avoid snapping by pressing Ctrl. If you are Ctrl-Left-Clicking to extrude, the button being enabled or disabled controls whether you snap or not. ‘G’ sets what you are snapping to. So, for retopologizing we want to use Faces (which is shown). ‘H’ shows I am using the Median of the item I am snapping to… I think… I’m pretty sure. 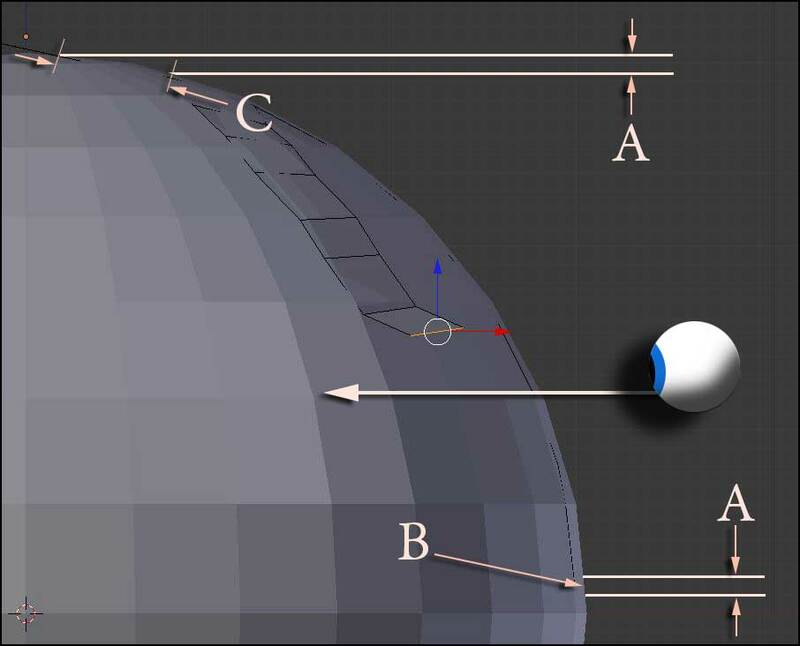 If you look up near ‘B,’ you see Blender is showing the median of the selected edge. That choice is controlled by the Pivot Control button way over to the left. ‘I” is the control that makes snap reach outside the currently edited object to snap to other objects, in this case the sphere. 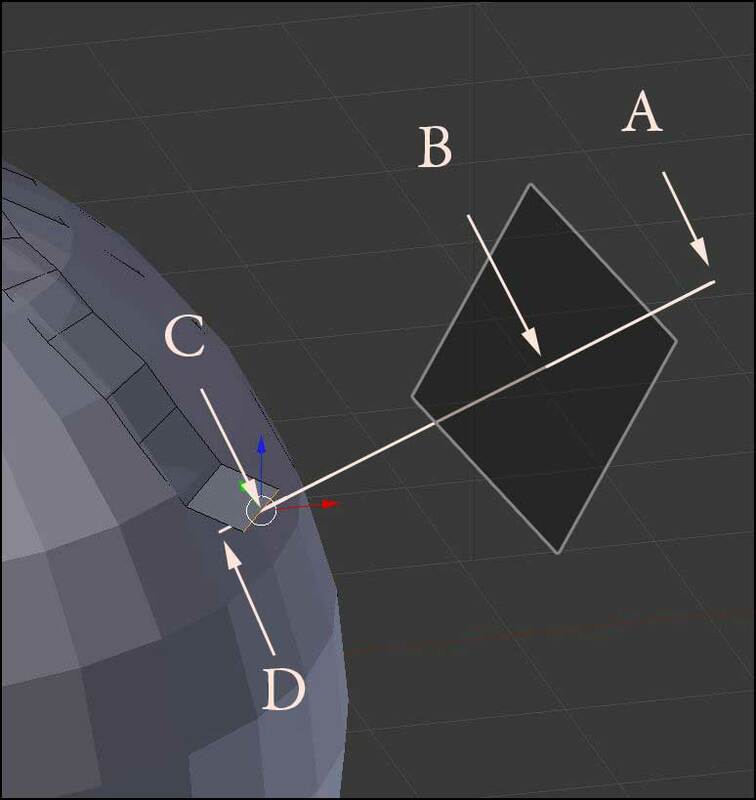 If you start to click toward the edges of the sphere where the polygon faces are more perpendicular to the screen than they are parallel to it, you start to lose control of where ‘D’ (Image #2) will land. Look in Image #3 to see what happens. I’ve shown the eye to show which way you are looking through the screen to see the sphere. If you are clicking near ‘B’ on the bottom line then move up to the upper line the amount (A) you move the mouse and where the point you select is are about the same. When picking near ‘C’ the distance you see the mouse move is the same ‘A’ distance, but the distance at ‘C’ is much greater. To make the selections work as one would expect, you need to keep moving the model (sphere in this case) so the faces you want to move things to (click on) are as parallel to the screen as possible. Once this makes sense to you, it is easy to control the snaps and create new topology… but you may have gotten that from the video the first time. I’ll be using this technique in other tutorials. This entry was posted in Blender, Clothes Skins Etc, Mesh, Second Life and tagged Clothes, Tutorials. Bookmark the permalink.